Departing the wooden shed world and selecting one of the recent pioneering designs of plastic manufactures is a progressive journey many are undertaking. Determined to ditch maintenance for freedom represents the benefits of a resin composition. Various 7 x 7 resin storage sheds are reviewed on this website owing to these hugely sought-after dimensions meanwhile this type of makeup is becoming a well favoured alternative for outdoor storage accommodation arising from their resistance to rot, fracturing and fade whereas a lightening cleanse with a hosepipe-shower restores their new-look in minimalist time. Unwinding the garden hose on a summers evening, watering the plants along with washing the shed is a job I’ve become quite accustomed to & frequently undertake due to convenience. A few minutes later the pristine finish radiates back through displaying assembly day’s appearance – simplicity in a nutshell. If a modish style is on your agenda, relishing the prospect of breaking free from up-keep duties, replaced by an effortless cleaning procedure meanwhile a 7 x 7 footprint fits your location to squirrel away those garden & patio necessities, inspect Lifetime’s features represented with their 7 x 7 ft facility. 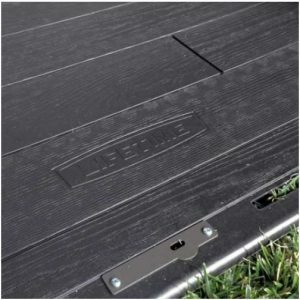 Lifetime are firmly established in the USA, manufacturing sheds through their potent low-maintenance plastic design termed High Density Polyethylene (HDPE). Secured around a robust steel infrastructure their 7 by 7 footer has become a well desired weatherproof favourite, displaying a desert-sand facade topped off with shingle style roofing and wide twin doors that provide oceans of storage access. 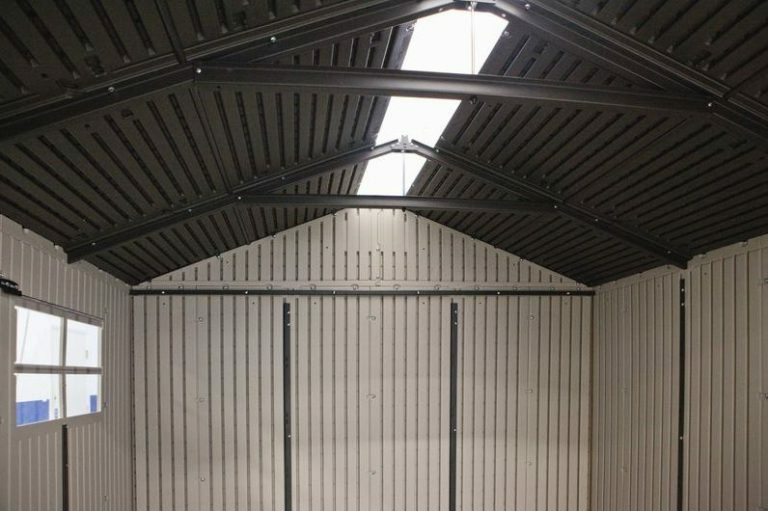 Two sheds make up Lifetime’s 7 ft width range, the smaller facility spanning 4 feet in length, constituting identical looks & frontage dimensions, only the depths separate them. Another course of action regards Lifetime’s 8 x 7.5 ft alternative with similar dimensions represented within their dominant 8 ft wide range consisting of many different lengths. Shed Ranges displays a varied resin shed assortment with styles & sizes to suit most desires & spaces. 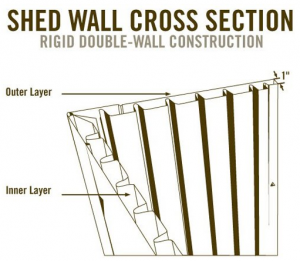 The walled facade exhibits modish style exhibiting desert-sand tones, molded through a High Density Polyethylene process into a creation of a double-wall skin, ribbed on the inside delivering robustness whilst displaying a resemblance of horizontal wood panelling to the outer-surface embossed with elaborate details of textured grain. The ribbed inner wall delivers the advantage by reinforcing the outer-skin to resist the demise in appearance dents and chips reveal, the downfall of single skinned structures. Furthermore in accomplishing overall stability, each facade sheet bolts to the metal infrastructure with quality steel screws. By utilising a UV stabilisation procedure to the polyethylene armours the composition with sun-ray protection. Having the ability to survive the strain of sunburn assault overcomes unprotected plastic’s inherent colour distortion issues, best described as a bleaching effect meanwhile the toughening compound strengths the structure to withstand cracking. The benefits of polyethylene regard its immunity from rot & decay resulting in a near zero-maintenance shell absent from entailing laborious re-coats of preservative varnish notwithstanding the impervious material’s effortless cleaning operation. Even the steel framework to which the panels secure to are treated with anti-rust protection. A spray-hose or light pressure-wash is generally the only upkeep necessary to restore the polished appearance once the dirt manifests. Soft brush scrubbing with the aid of household detergent washes away anything ingrained. I never seem to procrastinate the hosing duty, attributable to the handiness of the garden hose making the convenient showering down procedure quite a fun role & expeditious to administer on a summer’s evening. High Density Polyethylene is a 100% eco-friendly recyclable plastic resulting in a weather-resistant, low-maintenance & durable material that doesn’t disperse detrimental toxins into the environment. Lifetime incorporate the well favoured apex design for their 7 x 7. The high angled pitch forestalls rainwater puddles, delivers fast drainage meanwhile benefiting from a generous overlap with the facade averts the possibility of rainwater gaining entry where the walls abut against the roofing structure. 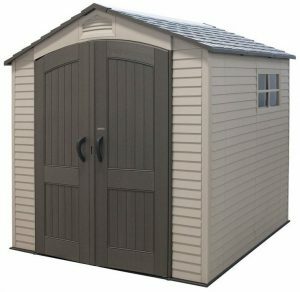 The roof arrives in panels, manufactured from High Density Polyethylene into a dual sided formation, the underside is ribbed for reinforced support whilst the most impressive slate effect molding procedure is produced on top exhibiting a guise of real-life tiling, attractively crowning the shed with flair & durability. Lifetime boast this shed can accommodate even more snowfall than their well trumpeted out heavy duty 8 ft width assortment owing to their shorter roof span meanwhile shoring up reinforcements, 2 A-Frame designed steel beams combine together producing a truss system stretching out across the inner apex breadth enhancing undergird bracing to the roof framework. Lifetime roofs are impermeable to rainfall. 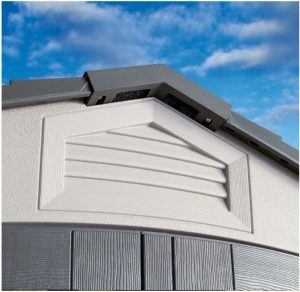 Unlike roofing felt’s structural deterioration once under the duress of damp conditions, High Density Polyethylene’s makeup remains immutable without succumbing to disintegration through climatic changes, be it driving rain, heavy snow, damp conditions or sweltering sunshine, putting an end to future roof replacements. Lifetime’s built-in floors are specifically designed for the shed to uphold a leaf-free & dry interior. A base perimeter deficient from crevices prevents gusts of wind blowing debris through, rainwater puddles emerging on the shed floor and pests crawling through determined for shelter. We find this feature really beneficial once Autumn approaches. The floor’s makeup regards High Density Polyethylene, molded into a staunch muscular bed further enhanced with extra toughening ingredients blended within the resin mix to increase robustness. Built to survive the challenging pressures wheeling-in heavy lawnmowers endure becomes a non issue, it’s purposely designed to subsist the stresses. Manufactured into this hefty resin base incorporates an anti-slip design delivering a grip-able surface whilst the composition is stain resistant to oil and solvent spillages, only requiring a quick clean up when anything’s spilled. Lifetime advise to anchor the floor down onto a solid flat substrate to enhance overall stability. 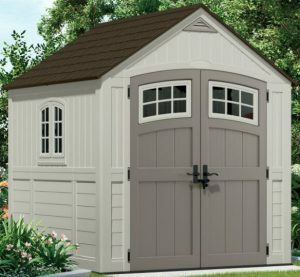 Anchorage is highly recommended by all resin shed manufacturers, unfortunately sales sites seldom mention the importance of these stipulations. Anchor screws are not provided, their type is conditional to whether a concrete or wooden base has been laid. It’s worth noting that levelled firm foundations to which a shed floor lays upon are key to delivering hard wearing performance for this type of manufacture, they are purposely designed to survive weighty stresses if the foundation rules are adhered to. Inside this 7 x 7, there’s roughly 42 sq.ft of storage expanse, over 6 ft in height from the truss down to the floor, then more room above the truss system up in the rafters, satisfactory for an adult’s height to walk around without getting that cramped in scenario. This shed includes 3 shelving units that rigidly secure to the steel infrastructure which are okay for small goods but rather limited for larger implements however we and many other plastic shed owners install the tiered free-standing variety and large stacking boxes to make use of their sturdy advantage in accommodating weighty storage up towards the ceiling, exploiting the shed’s loftiness. Two poly-carbonate windows that open half way for additional ventilation accompany the length-ways running skylight embedded within the apex ridge to illumine daylight inside meanwhile freshness is generated through two-sided screened ventilation, averting condensation build-up and the progression of a sweaty ambience evolving whilst ensuring a blockage from pests looking to enter. 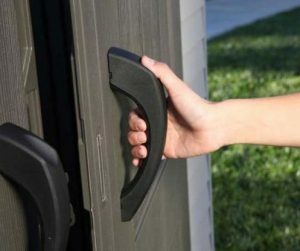 Popular storage options include: Parking a lawn-mower & mobility scooter, storing gardening equipment & long handled tools, barbecue paraphernalia, bikes, patio furniture & accessories whist providing a fab haven for the kids gear. A swift toys tidy-up can be accomplished here through this broad entryway. Broad robust twin doors grant spacious access into this 7 x 7, delivered by a 54″ width and 75″ high arch eliminates bending over upon entry whilst wheeling-in duties are aided by the floor’s access threshold. Manufactured from a dual lining of High Density Polyethylene including their steel reinforced advantage enhances security measures whilst providing a rigid fixing for the doors hardware. Internally the manufactures ribbed formation increases the doors robustness whilst on the outer surface a stylish resemblance of wood panelling is created through the molding procedure, shaded brown. A built-in padlock loop locks both doors simultaneously, large grip-able handles make entry a breeze meanwhile instead of individual hinges, Lifetime incorporate full length steel hinge pins for their doors operational swing. Keeping the left facing door shut in windy weather is by virtue of two deadbolt latches fit on the internal side, top and bottom. They slide into slits above and below the door, maintaining the door’s closed position. It’s imperative all resin based structures are constructed from solid level foundations. Their criteria regards compiling a perfectly levelled base of either wood, paving slabs, concrete or asphalt etc to ensure a perpendicular stance is derived from the footings, resulting in the roof weight applying equilibrium force across all four sides. A level base enables the construction of a streamlined assembly due to the straightforward alignment of the facade and roof panels plus determines accomplishing a true 90 degree angle for the doors architraves, ensuring the doors operate their swing accordingly. A solid foundation provides the ideal substrate for rigid anchorage, imperative to determine enhanced stability whilst a flat solid base enables the resin floor to serve its robust description regarding surviving substantial stresses endured by weighty gardening equipment. This 7 x 7 is distributed flat-packed requiring DIY assembly, a matter of two people implementing the demonstrated procedure stepped out in the instructions. A drill-driver adjusted to low-torque becomes your best friend to drive in the heaps of screws. Recommendations relate to keeping the panels in the shade to prevent their expansion if erecting on a sunny day and to postpone assembling in gale-force winds owing to predicted frustrations. Wait for a calm day is advised. 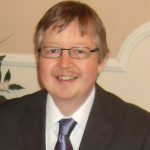 We took plenty of tips on-board from previous assemblers offering their advice. Many offsite jobs like installing the door hardware were done days before constructing plus planning ahead by organising all the parts to coincide with the order of instruction steps prior to assembly expedites the procedure. Reading between the averages, this 7 x 7 takes approximately 6 hours to complete. The assembly video below delivers the gist of construction. Once finalised, the shed requires anchoring through the floor’s indented anchor placements. Competition regarding a resin composition with 7 x 7 ft dimensions is gaining momentum, there’s some high quality new resin designs hitting the market recently, their popularity regards low maintenance accompanied by well-favoured dimensions to accommodate most garden placements. Shed Sizes displays similar resin constructions represented in order of size to enable fitting the tightest of spots up to accommodating oceans of storage room. Delivering high quality secured around a sturdy steel infrastructure, Lifetime’s High Density Polyethylene make-up is molded into a rigid composition besides exhibiting stylish looks. Not only attractive in appearance the beauty lies within their weatherproof composition, resistant to damp & heat deterioration, requires no conservation duties yet is a doddle to keep clean. Wide double doors provide oceans of access, air vents create and maintain a fresh internal aura whist windows and a full length skylight deliver daylight into this mid-spacious amenity. An attractive design that will complement any garden’s landscape meanwhile serving to store an abundance of outside gear. Lifetime boasts their High Density Polyethylene design surpasses the quality of their competitors, I’m not qualified to judge however they are highly regarded, flooded with superior feedback from those who comply with the correct foundation stipulations. Couple this with ten years of warranty cover, there’s confidence. 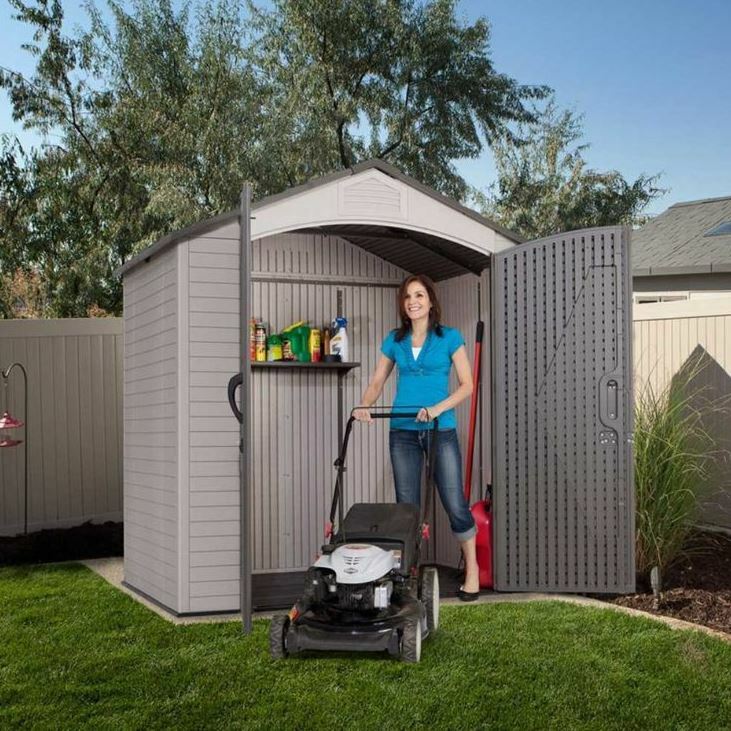 Thanks for reading about Lifetime’s 7 x 7 Resin Storage Sheds. 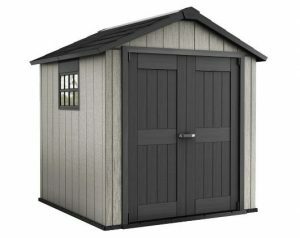 If you have any related 7 x 7 ft shed questions or advice, please share with readers. Please share this 7 x 7. Thank you! These outdoor garden sheds are beautiful. Their pleasant designs and attractive looks make them real winners. No rotting wood and easy maintenance add value to them as well. A quick hose-down and they are back to looking like new. Great value for the money and super for tidying up the backyard. 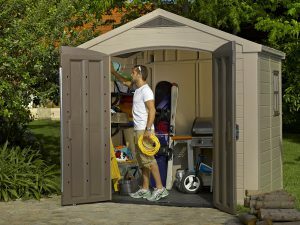 Thanks for calling in to read about Lifetime’s take on a resin shed spanning 7 x 7 feet. 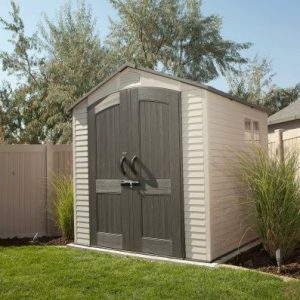 Lifetime sheds plus their competition displayed up above certainly exhibit architectural stylish appearances, destined to compliment and brighten up any home-yard space, deciding the model is purely down the choosing your preferred style for the garden location. Only the Factor shed cuts back a tad on finishes however this is purely down to their competitive edge. No rotting wood, replaced with an effortless hose down is what initially swayed us down the resin avenue. They are a pleasure to clean, the cleaning role’s accomplished in minutes rather than been confined to annual tasks of conservation duties our last wooden shed demanded. It’s been a great decision for our behalf. Yeah, I’m a bit fussy regarding keeping a clean garden, a shed is a gardeners best friend for organising and keeping the tools away from indoors. 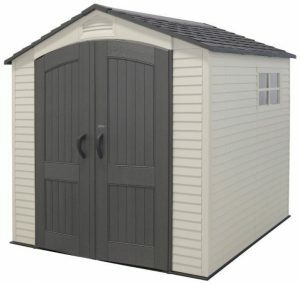 Great for kids toys too, we have plenty of friends where their shed is practical used for a toy store. Their outdoor storage potential is rather vast. I have a big garden and lots of tools to store. I was just looking for a storage shade on the net, and luckily, I’ve come across your website. I really like the Cascade’s Prettiness shade because of the windows. I think it is very decorative:) I just would like to know. These shades look very strong, no doubt about it. But do you think the shade will stand up to strong winds and rains? 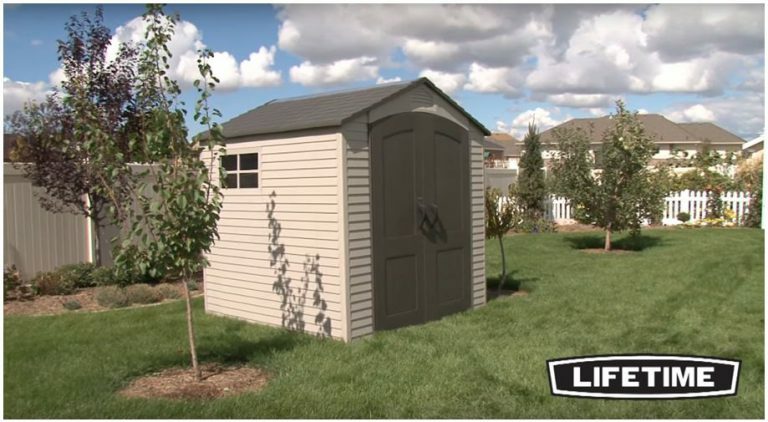 Thanks for taking your time to read about Lifetime’s version of 7 x 7 resin storage sheds. 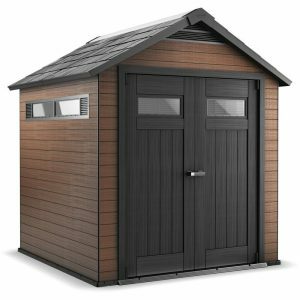 Yeah, the Cascade exhibits such an idyllic picturesque display, it’s one popular shed receiving reviews to match the looks plus it comprises an identical footprint to this reviewed Lifetime shed. Two very similar sheds, leading the decision purely down to appearances. I have to agree with you, Cascade certainly parades architectural style displaying arched windows across the stony doors and vanilla shaded facade, very decorative. 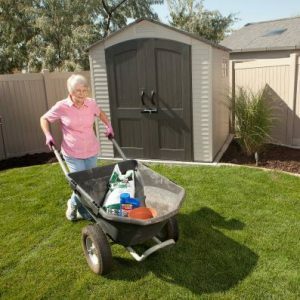 The key to accomplishing a long standing shed is purely down to situating on solid level foundations to assure a perpendicular stance is derived, where the roof weight applies equal force across all sides and the doors operate correctly. Complying with the foundation rule and anchoring the shed down increases wind resistance levels many times plus it makes assembly straightforward as the panels align at ease. A perfectly aligned construction alleviates leaks, they are designed to stand up to driving rain. Another huge benefit preparing the correct foundations is the floor is then able to stand up to demanding stresses endured by weighty equipment therefore side stepping the recommended foundations is not advised, everything falls into place from this first step. The first thing I notice here is that there is no color nothing to grab a customers attention when the page pops up. Add some background color on the banner add color to the storage even if it’s a basic primary color it will add to the page. You did an awesome job detailing the how to build these sheds and the detailing of the sheds is great. Add some color to the top of the page and it’ll be super awesome. Thanks for providing me with some website feedback, I appreciate your help. I’m no expert in website design, the reason I chose the most basic WordPress template, hence the bland appearance however we’re not a sales site, not here to push any sales nor have we any allegiance to any particular manufacturer, hence the reason it’s not glossy nor are there any annoying pop ups appearing, we’re just a very straightforward website. As long as visitors can delve into honest & detailed information to aid making an informed decision prior to purchase is really all we care about, the shed images and videos hopefully brighten the posts up a tad. I really like all the information you have provided on this shed. I am playing with the idea of replacing my weather worn wooden shed with a new one, and have looked at resin sheds as an alternative. 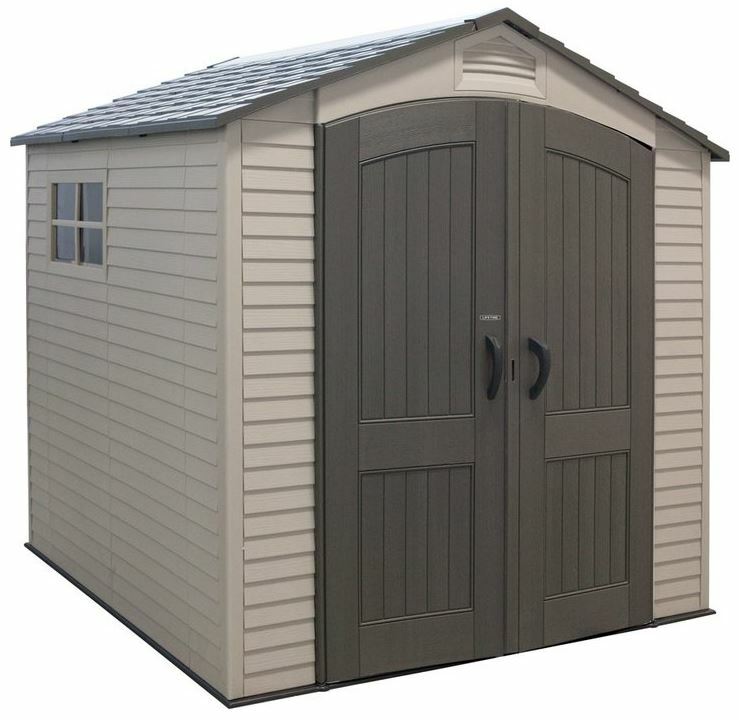 Thanks for visiting to read about Lifetime’s 7 x 7 resin storage sheds. Your search for an alternative make-up to wood in order to escape the constant upkeep duties they demand sounds a very similar situation to what we found ourselves in. I don’t think you can put a life expectancy onto resin when used through normal conditions as the material is immune from weather decay and resists deterioration. I heard the other day that it takes a normal plastic bottle that’s been thrown into the ground over 100 years to start to decompose, so I wouldn’t like to guess a time limit on High Density Polyethylene, the reason they are 100% recyclable. I checked whether there are any colour options with a Lifetime shed but this desert-sand colour is the only option. Shed Ranges shows alternative resin sheds, different colour options including paintable resin that allows customisation. Nice Site It looks like those sheds are maintenance free also which is a big plus. 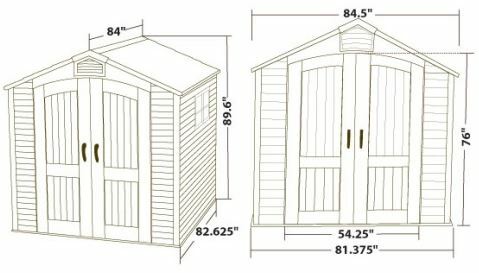 I currently need an 8 by 12 foot shed myself don’t know if you offer those and the extra size might be a problem for load bearing roof ? Not sure about that but it is something I’d like to look into. I like that you use several pictures so you can see the size relative to yard tools etc. The low maintenance issue is what initially caught mt attention towards the resin style due to the hassle that my last wooden shed succumbed to once the rot set in. 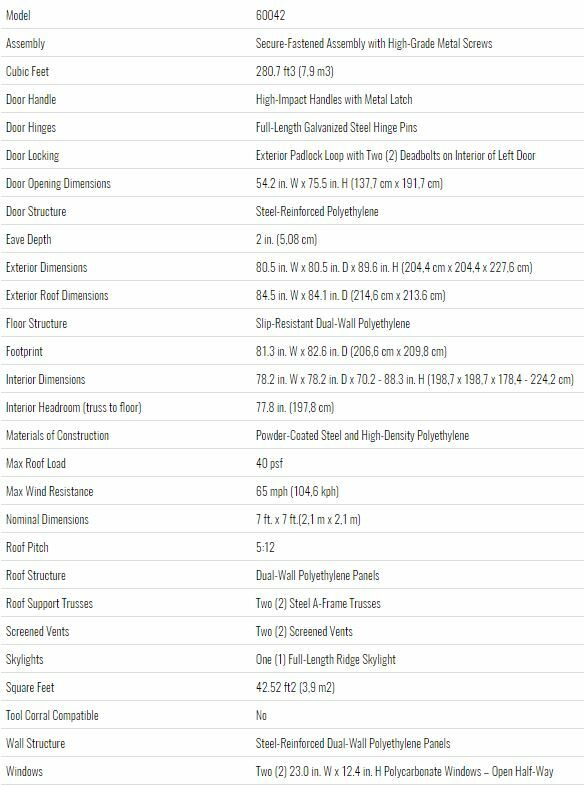 Yeah, Images, videos and measurements are a critical part of each review to provide visitors with a clear understanding of the sheds features.